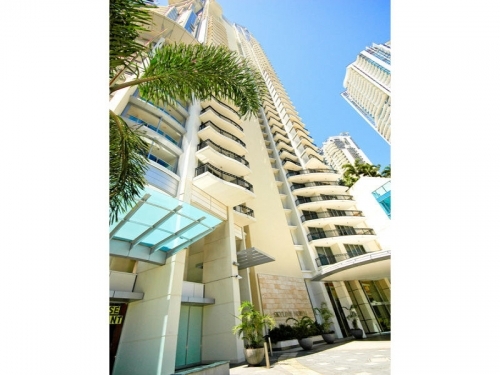 Chevron Renaissance incorporates three majestic towers right in the heart of Surfers Paradise offering its guests a convenient location within walking distance to Surfers Paradise beach. Directly below each building you will find an excellent selection of shops, restaurants and the entertainment hub of Cavill Avenue which is a short 2 minute walk away. Our Chevron Renaissance Private apartments are of excellent quality and offer ducted air conditioning, contemporary furnishings, gourmet kitchens, full laundry and large outdoor entertaining balconies as standard. You can select from our low floor, mid floor, and high floor ocean and river view apartments to suit your needs and requirements. When it’s time to explore the resort you can’t go past “Beaches in the Sky”, set amidst tropical manicured gardens and located centrally between all the towers, it offers an outdoor swimming lagoon and spa with private beach, gym, and heated indoor pool. Guests can also utilize the children’s playground and large lawn area that is ideal for relaxing and sunbaking. There is also a outdoor lap pool with exceptional BBQ facilities, private theatre (available for hire) and games room. For the security of our guests, the resort provides free secure parking and 24hr monitored security. Stay for 10 nights or more and receive a mid-stay service which includes a clean and fresh linen and towels. Book with our Agency to ensure you get the exact apartment you see online upon arrival- if you want an ocean or river view, we guarantee you will get one!